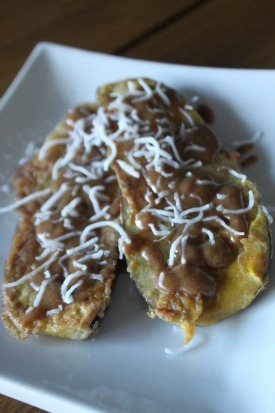 MamaEatsClean: Egg Plant French Toast - This is really good. Really! 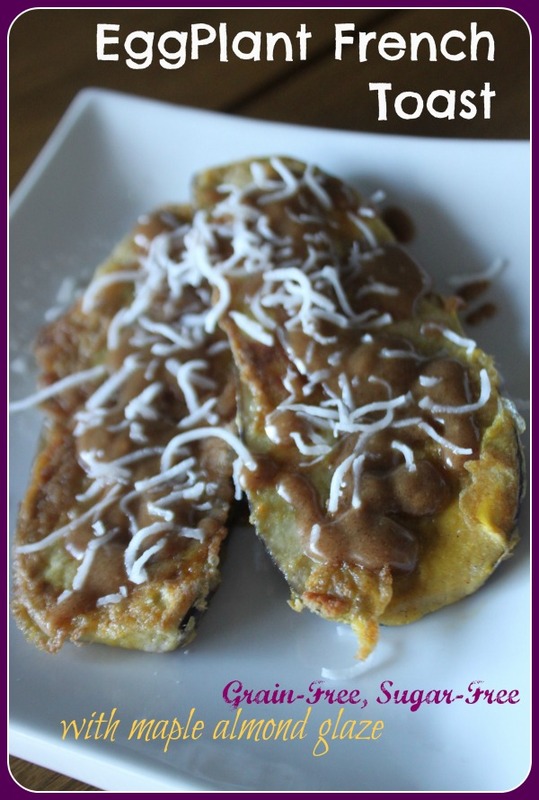 Egg Plant French Toast - This is really good. Really! I've been at this clean eating for about 9 months now. And I still can't believe some of the concoctions I come up with and ENJOY these days. My old self probably wouldn't have even been willing to try this. I would have scoffed at the idea. But its actually quite delicious. And its fun to think outside the box and try something new. Or try something old in new and unexpected ways. I have been on a bit of an egg plant frenzy the past couple of days. Egg plant pizza crust (yum), egg plant lasagna (yum) and now egg plant french toast (double yum). The french toast gets a double yum because it is a borderline sweet treat, not a savory. And we all know how I feel about sweets - I love them. They just don't love me back. But no worries. This recipe is fully Candida, Paleo, Wheat-Belly and Low-carb diet friendly. And its sugar-free. Its a great way to change up breakfast if you are getting tired of eggs and/or smoothies like I am. Give it a try and let me know what you think. Wash the outside of the baby egg plant thoroughly with a vegetable brush. If you are not using baby egg plant you may want to peel the skin and/or sprinkle with salt and let stand for a few minutes to get some of the bitterness out. Cut off both ends. Cut into thin slices vertically. Put the coconut flour in a shallow pan. Dust each piece of egg plant in the coconut flour on both sides so it is well covered. Mix the beaten egg with vanilla, cinnamon and salt. Dredge each piece of dusted egg plant through the egg wash on both sides letting it soak up some of the egg (i.e. don't do this too quickly - let it bathe in there for a few seconds). Fry the egg plant on a skillet over medium heat in melted coconut oil or butter. Each side should take about 3 minutes to cook. Remove to a plate and drizzle with maple almond glaze. Place all ingredients in a microwave safe glass bowl. Microwave on high for approximately 30 seconds. Stir until smooth. Put back in microwave for a second time if not smooth (20 seconds). Stir again. Drizzle on egg plant French Toast. Sprinkle with unsweetened shredded coconut.